Asus, the popular Taiwanese phone manufacturer has collaborated with Flipkart to celebrate Asus OMG Days by offering exciting deals and discounts on the entire range of Zenfone. 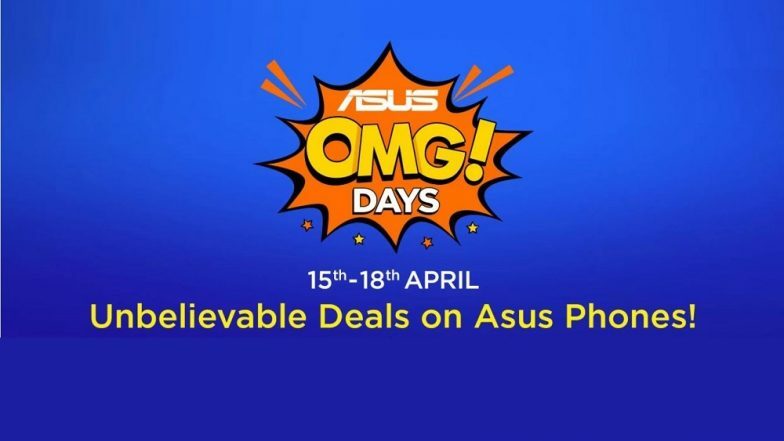 As a part of OMG Days sale, Asus is offering attractive discounts on the entire range of Zenfones starting from today onward till April 18, 2019. The customers can avail this excellent opportunity to grab some money saving deals during this 4-day sale. The customers will be getting up to Rs 3000 flat discount on Zenfone 5Z, Zenfone Max Pro M1, Max M2, Lite 1 and other Zenfones. Moreover, the customers can also avail no-cost EMI option on Bajaj Finserv, debit as well as credit cards across all the banks. Additionally, Flipkart's Complete Mobile Protection Plan is also available at an attractive price point, which also covers theft. OnePlus 7, OnePlus 7 Pro Launch Date Leaked? Likely To Be Launched Globally on May 14. Asus Zenfone 5Z: Asus is offering flat Rs 3000 discount across all the variants of Zenfone 5Z. The price of the base variant with 6GB RAM and 64GB internal storage has been reduced to Rs 21,999 from Rs 24,999. Similarly, the 128GB and 256GB variants are listed at Rs 24,999 and Rs 28,999 during Asus OMG Days sale instead of Rs 27,999 and Rs 31,999 respectively. The e-tailer is offering no-cost EMI option till 6 months on Bajaj Finserv and all debit and credit cards. Asus Zenfone 5z Review: An Affordable Choice with Premium Looks and Flagship Performance. Asus Zenfone Max Pro M1 & Max M1: Asus is offering flat discounts of Rs 500 and Rs 1000 on Asus Zenfone Max Pro M1 and Max M1 respectively. The base variant of Max Pro M1 with 3GB of RAM is priced at Rs 7999 whereas the mid variant with 4GB RAM costs Rs 9999. The top-end variant with 6GB RAM retails at Rs 11,999. On the other hand, Max M1 is available at a special price of Rs 6499 during the Asus OMG Day sale. Both the smartphones are eligible for no-cost EMI option on Bajaj Finserv, credit and debit cards. Asus Zenfone Max M2 Smartphone Review: A Budget Phone With Excellent Battery Life. Asus Zenfone Max M2 & Max Pro M2: The smartphone is also listed on Flipkart with a discount of Rs 500 across all the variants. The original price of 3GB and 32GB variant is priced by Rs 500, which brings the cost to Rs 7999 from Rs 8499. On the other hand, the 4GB variant is also available with a discounted price of Rs 9999. The company is also offering attractive deals on Max Pro M2, however, there is no special discount on the handset. But, the customers can avail no-cost EMI option on both the handsets. Asus Zenfone Lite L1: Asus' most affordable smartphone Zenfone Lite L1 is also made available at OMG Days sale wherein the customers can purchase the phone at a discount of Rs 1000. As a part of Asus OMG Days sale, the Asus Lite L1 is listed with a discounted price of Rs 4999 on Flipkart. Moreover, the no-cost EMI option is also available for 3 months and 6 months across all debit and credit cards as well as Bajaj Finserv.